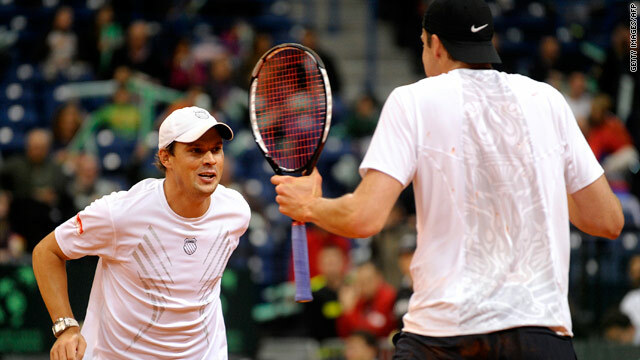 Bob Bryan and John Isner celebrate their win over Janko Tipsarevic and Nenad Zimonjic in Belgrade on Saturday. Bob Bryan and John Isner kept the United States in their Davis Cup tie with Serbia after they claimed victory in Belgrade on Saturday. France could face defending champions Spain in the quarterfinals after cruising past Germany in their World Group first round tie. India's hopes of advancing are still alive after Leander Paes and Mahesh Bhupathi claimed victory over Igor Kunitsyn and Teimuraz Gabashvili. Radek Stepanek and Tomas Berdych handed the Czech Republic a 3-0 win over Belgium in Bree, as they defeated Steve Darcis and Olivier Rochus. Bob Bryan and John Isner kept the United States in their Davis Cup tie with Serbia after they claimed victory over Janko Tipsarevic and Nenad Zimonjic in Belgrade on Saturday. Bryan and Isner claimed a tight 7-6 (10-8), 5-7, 7-6 (10-8), 6-3 win which cut Serbia's lead to 2-1 in the best-of-five series. Bryan and his twin brother Mike are the number one doubles team in the world but Isner was a late replacement for Mike Bryan, who contracted food poisoning Saturday. The American pair only dropped serve once to lose the second set, but took two long tie-breakers and cashed in two service breaks to take the fourth set and the match. Isner, who lost two tie-breakers in a three-set loss Friday to Viktor Troicki, will face world number Novak Djokovic in the first match Sunday while Troicki battles Sam Querrey in the final match of the series. The U.S. must now win both singles matches Sunday or Serbia will earn the Davis Cup quarterfinals spot against bitter rivals Croatia, who won their first-round series against Ecuador. Marin Cilic and Ivo Karlovic coasted to a 7-6 (7/3), 6-3, 7-5 win over Nicolas Lapentti and Giovanni Lapentti in Saturday's doubles to give Croatia an unassailable 3-0 lead. Michael Llodra and Julien Benneteau defeated Philipp Kohlschreiber and Christopher Kas 6-1, 6-4, 1-6, 7-5 to take an unassailable 3-0 lead in Toulon. Spain currently lead Switzerland after opening up a 2-1 advantage thanks to Marcel Granollers and Tommy Robredo's win over Yves Allegro and Stanislas Wawrinka 7-6 (10/8), 6-2, 4-6, 6-4. Elsewhere, India's hopes of advancing are still alive after Leander Paes and Mahesh Bhupathi claimed victory over Russia's Igor Kunitsyn and Teimuraz Gabashvili in straight sets in Moscow. The winners will face either Argentina or Sweden with the former currently 2-1 up in Stockholm after David Nalbandian partnered Horacio Zeballos to a 6-2, 7-6 (7/4), 7-6 (7/5) victory over Robert Lindstedt and Robin Soderling. Radek Stepanek and Tomas Berdych handed the Czech Republic a 3-0 win over Belgium in Bree, as they defeated Steve Darcis and Olivier Rochus 7-6 (7/0), 6-0, 6-3. They could face the winners of the Chile versus Israel encounter in the quarterfinals where Nicolas Massu gave the Chileans a 1-0 lead Saturday after winning the opening singles against Dudi Sela 4-6, 6-2, 6-2, 6-4. Great Britain are 2-1 up in their tie with Lithuania after Ken Skupski and Colin Fleming won 6-0 6-7 (2-7) 7-5 6-3 in their doubles match against Dovydas Sakinis and Laurynas Grigelis.